Spirits are known to haunt hospitals, prisons and old houses where there has been a history of violent death. But it is rare when old school buildings are found to be haunted. An exception is the now vacant Elizabeth V. Edwards School building in Barnegat, New Jersey. 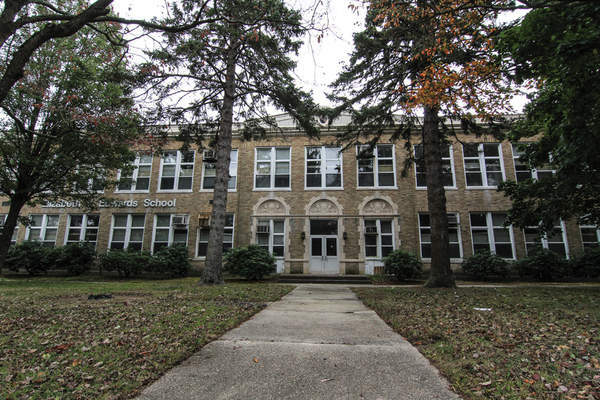 Named for the woman who served as the school’s first teacher and who continued on to teach until her death in 1965, the school has had a long history in the community. It opened in 1930 and operated until 2004. People believe "Lizzy" never left the school after her physical death. But she has remained a "good ghost" that does no harm. She just makes her presence known on occasion. Some say Edwards may have attracted a few ghostly friends to keep her company as they haunt the empty hallways. People who have worked in the building report slamming lockers, lights flicking on and off, and the sound of 1940s music echoing the halls. Art Walshe, a maintenance worker, claims to have seen the image of a translucent woman on at least two occasions. He said she was wearing a floral print dress. Her hair was combed in a bun. Bill Cox, a retired New York City detective, has been serving as transportation and security coordinator for the Barnegat school system since 2006. His office is located next to the abandoned school. He said he didn’t believe the ghost stories at first, but then something happened that changed his mind. He said he answered an alarm at the school complex early one morning. While there he noticed that lights were on in the second floor of the old Edwards school. It was a rainy night and he decided to return in the morning and turn them off. But when he went to the room that had been all lit up the night before, he found that all of the lighting had been torn from the ceilings. The fluorescent bulbs were still there, just piled on the floor. Walshe has been time in the old building doing general maintenance work. One night he was working alone on a ladder above an open door leading to the school’s dark auditorium. He said he heard a creaking sound and looked down to see the big door to the auditorium swinging. He said the experience frightened him so he slid down the ladder and fled the building. The next day when he went back to retrieve the ladder, he found it moved to another part of the building. At another time, Walshe said, he heard a telephone ringing somewhere in the building. He traced the ringing to the former principal’s office. He found the old rotary phone lying on the floor. It was not attached to the wall. The Edwards School was recently featured in the Syfy Channel’s show Ghost Hunters.